Ant made his first show in 1998 under the name Rotozaza. – a performance-based project which ended up spanning theatre, installation, intervention and writing-based works. His work, though varied in tone and content, has consistently played with a tension between liveness and automation. Most often, this has involved guiding people through unrehearsed performance situations, and since 2007 it has included the audience themselves within structures loosely defined as Autoteatro. 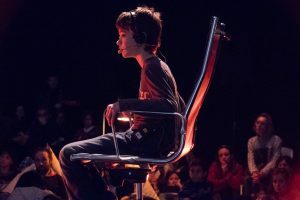 Rotozaza became a partnership with Silvia Mercuriali, and ended in 2009 after their last production Etiquette, which was also the first Autoteatro work. Since then Ant has worked with Glen Neath, Joji Koyama, Isambard Khroustaliov (Sam Britton), Tim Etchells, Gert-Jan Stam, Britt Hatzius and Christophe Meierhans to create the works listed here which continue to tour internationally – over 60 different language versions exist of the various Autoteatro productions created so far. Other solo projects include ongoing experimentation around ‚live portraiture / documentary‘ as The Other People: structured encounters with people from non-theatrical milieu. This strand of Hampton’s work has more recently begun to merge with the Autoteatro form (Cue China, Someone Else…). He was head dramaturg for ‚Projected Scenarios‘ at Manifesta7 Biennial for Contemporary Art and has contributed to projects by others, including Ivana Müller, Anna Rispoli, Jerome Bel and Forced Entertainment. Ant has also worked as coach / mentor for artist programmes such as MAKE (Ireland), A-PASS, Sound Image Culture (Beligum) and Dasarts (Netherlands) where in collaboration with Edit Kaldor he designed and mentored a 10-week block, ‘Every Nerve’. He has created and led workshops worldwide, including ‚Fantasy Interventions – Writing for Site-Specific Performance‘, and ‘Raising Voice in Public Space’ with Edit Kaldor. His recent work with Christophe Meierhans was to create an ‘automatic workshop’ which expands on the ideas behind Someone Else and his earlier work with Kaldor.